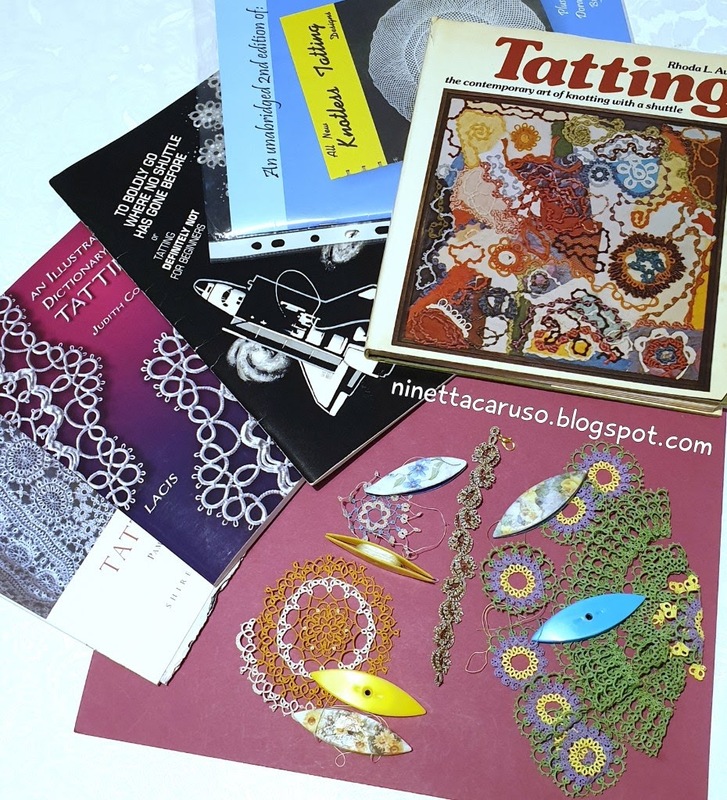 My Facebook's friends already know that I involved tatters in a special project, for the event "First Italian Tatting Meeting", to be held in Rimini, 17-19 May. 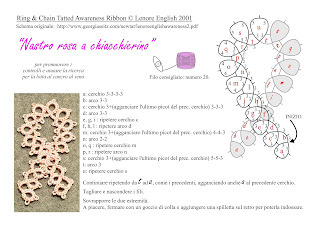 In the Facebook group "Chiacchierino: Filo, Amore e Fantasia" , I suggested to tat a little pink awareness ribbon, that would be taken to Rimini and left there as a present/reminder of the event, to the organiser Mrs Stefania Di Cesare ("P&D Original Design"). In case tatters can't attend the meeting in Rimini, they would post their pictures in the Facebook group. It can be easy tatted also by beginners and very fast. I hope that this project will be accepted and the pattern liked. Thank you very much in advance to every tatter. Thread is Anchor, size 70, it is very soft, but it is thin like the DMC size 80. Pattern is fast and easy: one shuttle and 5 rings. I finger tatted the second side of the last split ring. Start from the upper right wing, leaving a long tail (about 10cm). Ring1: 9ds, 5tds, very small picot, 1ds. 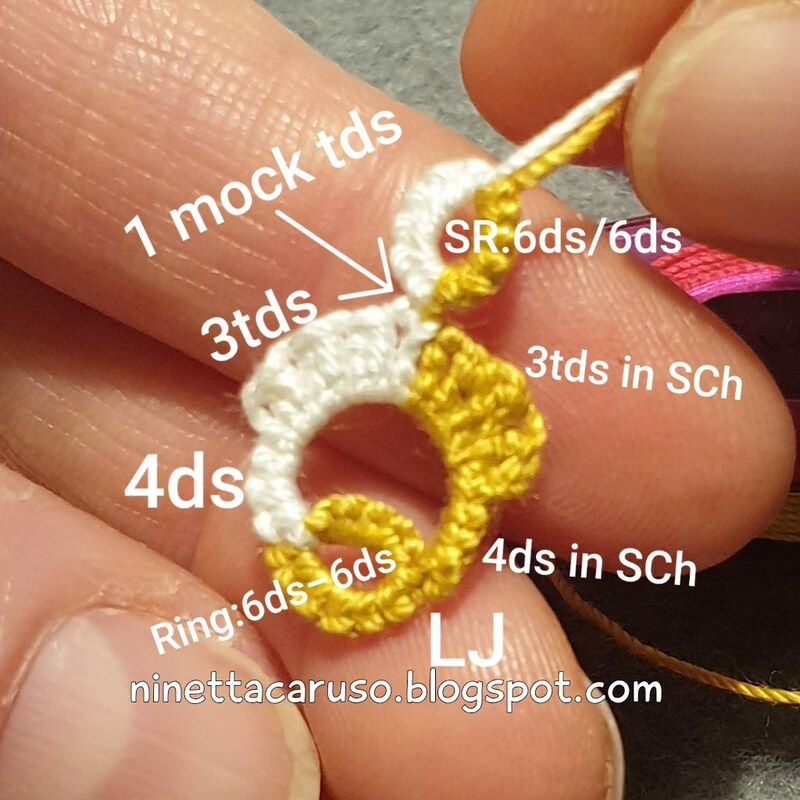 Ring2: 6ds, join, like in the ANKARS down join, the hidden picot between the 3rd and 4th tds of previous ring, then 7ds, picot, 2ds, picot, 6ds. Ring3: 6ds, join last picot in Ring2, 2ds, picot, 7ds, picot, 6ds. 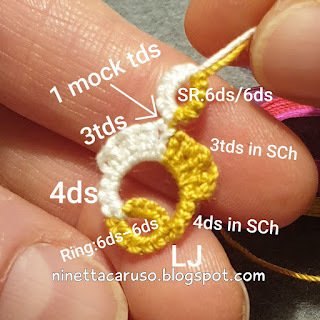 Ring4: 1ds, 2tds, TJ (treble join) to the last picot of Ring3, 3tds, very small picot, 9ds. Cut ends, that become antennas. 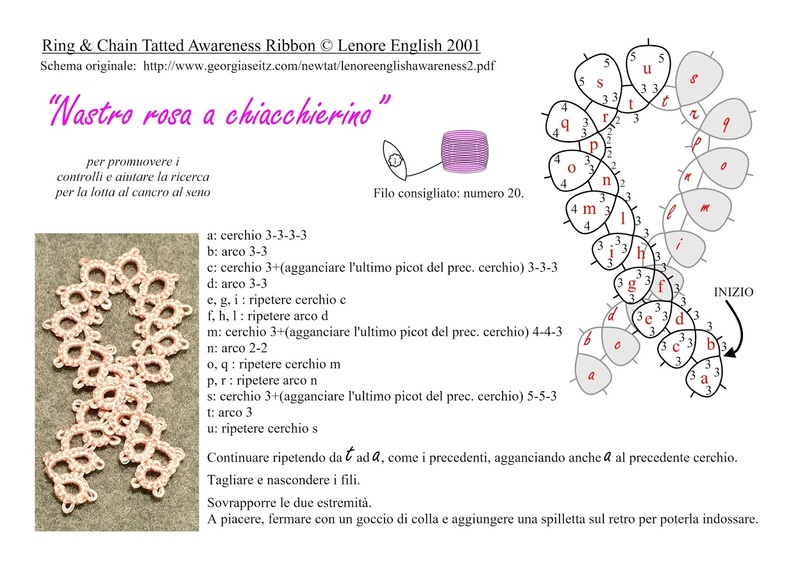 I'm very happy to tell you that, on Saturday 18 May (and maybe also on 19 May), I will teach the treble tatting stitch technique during the "First Italian Chiacchierino Meeting" (first ever! ), at the Hotel Crown, Viserba di Rimini, Italy. 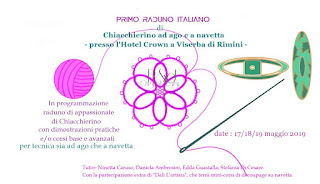 At the event there will be other great classes, being held by master tatters: Stefania Di Cesare, Edda Guastalla, Daniela Ambrosini. There will be also classes with "Dali L'artista", an artist who decorates shuttles. In case you're not in Facebook, I'll try to keep you updated. A contest is already started, connected to the meeting, it's jointly organised in two groups, everybody can participate even if unable to travel to Rimini. Details are in those groups and also in a new page named "Chiacchierino italiano: curiosità, eventi e manifestazioni sul territorio". It will be a wonderful tatting party! 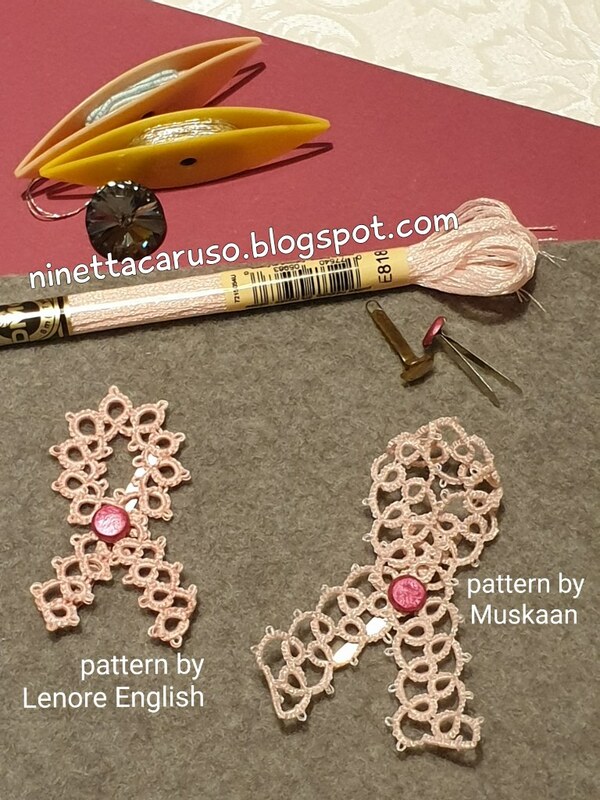 I've been studying for that event and I've already prepared a little booklet - in Italian, of course - that will be used as a reference during my class, there are 6 patterns with variations (there's one pattern that won't be shared elsewhere). In the picture, there are 3 shuttles decorated by "Dalì L'artista", who is a sweet lady, it's a pleasure to get to know her in person. She has a profile in Facebook, too. She's teaching me how to make stencils and also she's helping me in making the dollhouse's project. If you're wondering what I'm tatting in this moment, well, I've 3 projects started. 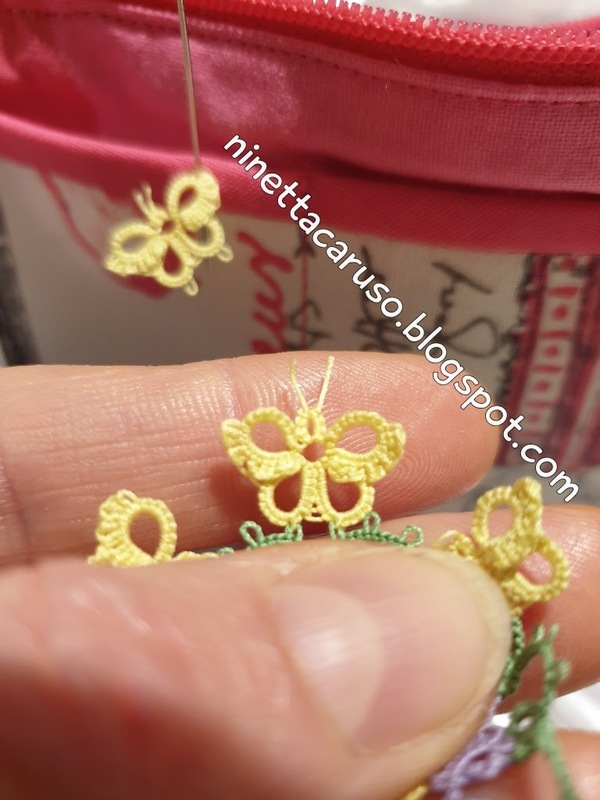 I'd like having one of those finished in time for Rimini, at least one, but lately I'm very slow at tatting! It seems I've been on facebook too much! 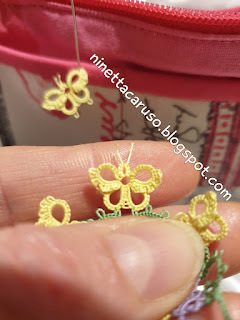 How to tat treble tatting stitches in split chains. You should already know how to tat double stitches in split chains. 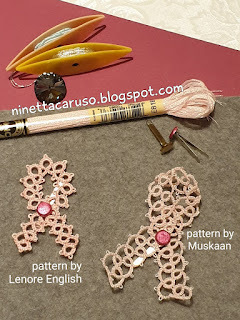 About split chains, there's an array of resources in Muskaan's blog, at this link: https://tipsaroundthehome.blogspot.com/p/tatting-resources.html, under the paragraph: "SPLIT CHAIN (SCh) / DORA YOUNG KNOTLESS (DYK) / BRIDGING". In the video I'm following a simple pattern, just to show the split chain and how to use it in a pattern where you need to climb out to a next round. 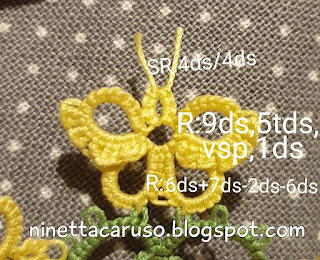 I've another post about tds in split chains, but it's how I tatted treble tatting stitches around a metal ring, from left to right (link: https://ninettacaruso.blogspot.com/2019/03/how-to-tat-tds-in-split-chain.html). In the current video, I'm tatting the second side of the split chain from the right to the left. At the end, I tatted a mock/faux tds and a split ring to climb out and continue the pattern without cutting the thread (nevertheless, I can already imagine some patterns that can have split chains without a mock tds). Starting the chain in the usual way, I tatted 4ds, then 3tds. Then I prepared the left side of the mock tds, tatting a vsp and one ds. Join (shuttle join) to the point the split chain has to end, then come back with 4ds in split chain. From now on there are 3 tds in the split chain. 1. Let the thread drop behind the bare thread. Bring the shuttle to the front and then through the loop. 2. 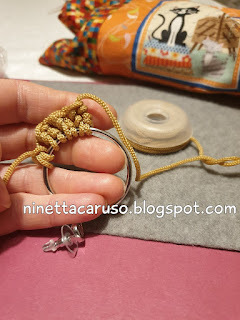 Pull the loop behind the bare thread and upwards, tighten it but leave a very short picot. That is the tricky part, because the picot tends to close. The height of this picot determines the height of the first treble stitch, then it has to be gently pulled, not tight. FIRST LOOP. Laying the picot across the ball thread and pull up a loop of thread through this picot. Keep that loop opened, holding it around the ring finger. SECOND LOOP. 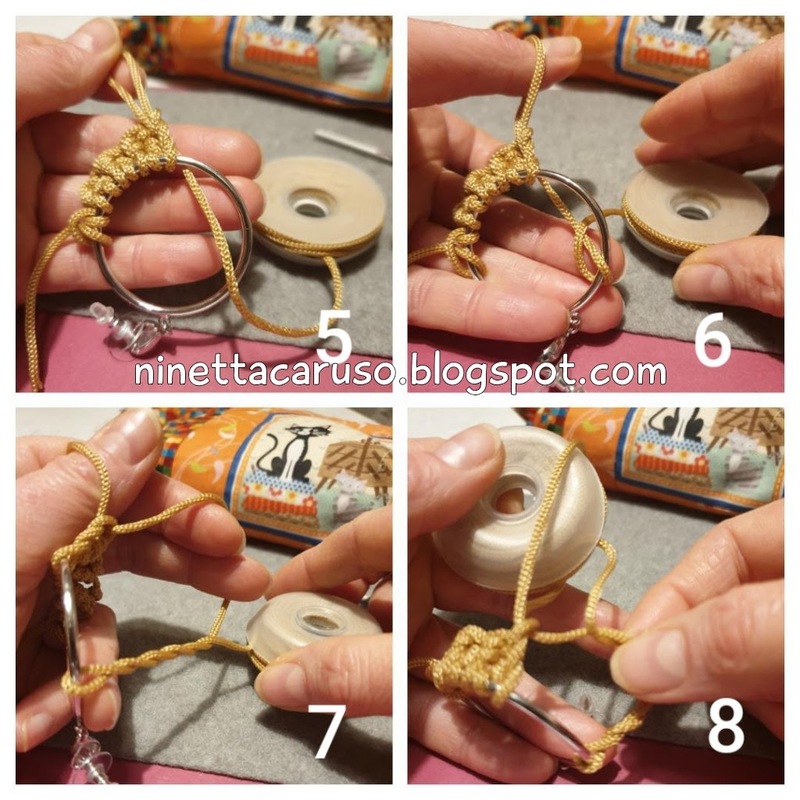 Take the shuttle thread from under the bare thread of the chain and anchor it around the middle finger (clockwise). THIRD LOOP. Bring it downwards around to the little finger (counterclockwise) and then back up to the chain. 4. Pass the shuttle behind and through the SECOND LOOP, from back to front, for a total of 3 times. 5. Pass the shuttle into the FIRST LOOP. 6. Close the FIRST LOOP gently pulling the thread between around the middle finger. 7. Close the SECOND LOOP pulling the thread around the little finger. 8. Close the THIRD LOOP pulling the shuttle's thread. I repeated the same for the next 2 tds in the split chain. I finished with a vsp and a ds in the split chain, that is the right part of the mock tds. The video end with a split ring. 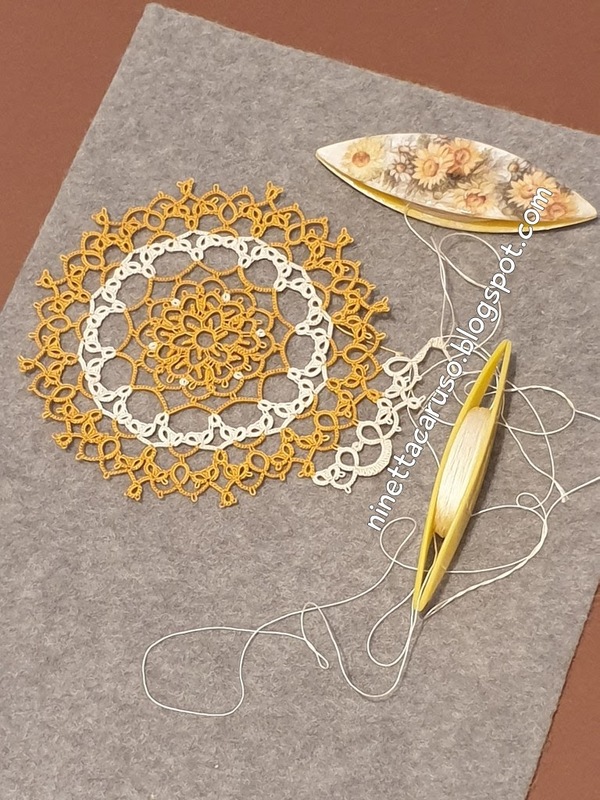 Split chains are very useful when you need to climb out in a pattern, without cutting the thread, I usually use them in my tatting. 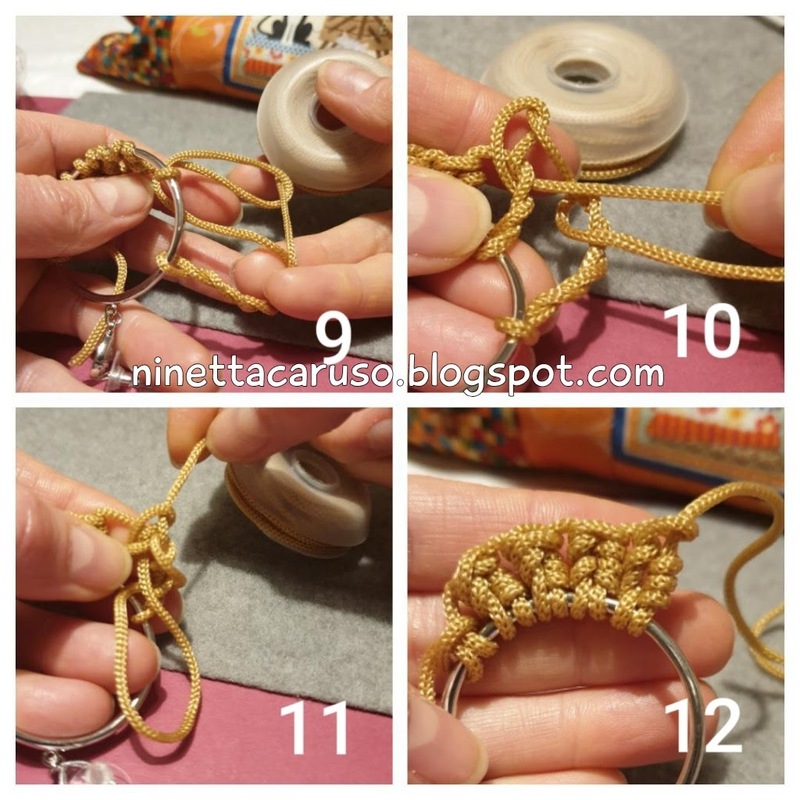 As a reference for how to tat a split chains with double stitches, there are many resources online. 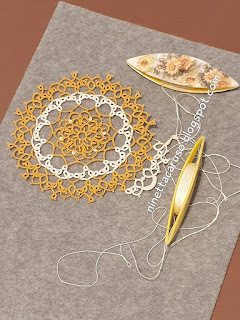 Muskaan collected a list of useful links in her page "Tatting Resources". Also, there are videos by Karen Cabrera, Frivole, and in the YouTube channel of the Georgia Seitz Online Beginning Shuttle Tatting Class. 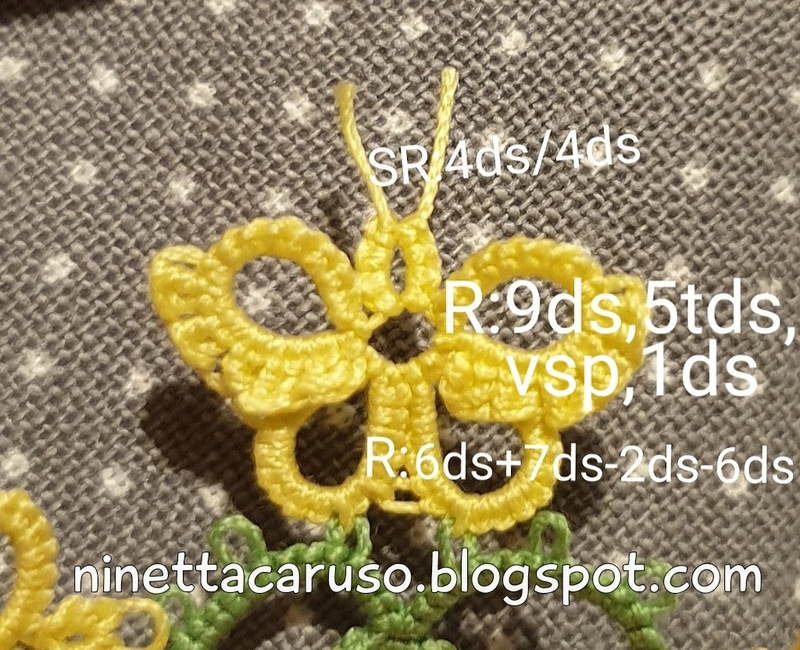 So, I've been seeking a way to tat the treble tatting stitch in split chains, too. I had to waive the complete double stitch within the treble, in fact there is only a first half stitch in the first "leg", but that little exception lets the stitch appearing, anyway. Here I'm using a metal ring, but it is the same concept of the split chain, if you substitute the ring with the bare thread. I used the ring for the sake of clarity, since I've used a very thick thread, thickness is - maybe - 3mm. 1. Let a loop of thread drop behind the ring. Bring the shuttle to the front and then into the loop. 2. 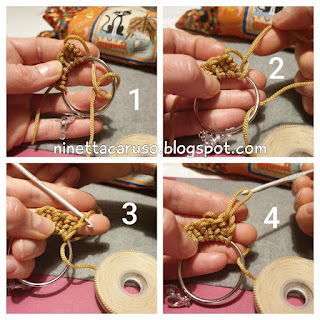 Pull the loop behind the ring and upwards, tighten it but leave a very short picot. 3. Laying the picot across the ball thread and pull up a loop of thread through the picot. That was the first "leg" of the stitch. That was the second "leg". 9. and 10. Close the first loop (that one in pic 4) pulling the thread between the two "legs"
11. Pull the shuttle to coil the second "leg". In pic 12 there is the stitch finished. I hope to have a pattern ready to be shared next week, with a practical example.